Sao Paulo is quiet this weekend. There are blocos out dancing in the streets – I can hear them coming up from Vila Madalena, as can the barking dogs, followed it seems inexorably by emergency sirens – but many folk have gone elsewhere to sample the delights of carnaval, while the city known in Brazil for hard work (and some say for not knowing how to play) pauses to draw breath. It rained heavily today, as it can in January and February. That dampens carnaval spirits. This year’s accessory is the clear plastic disposal anorak. Today I strolled down Rua Augusta to the corner of Rua Oscar Friere. 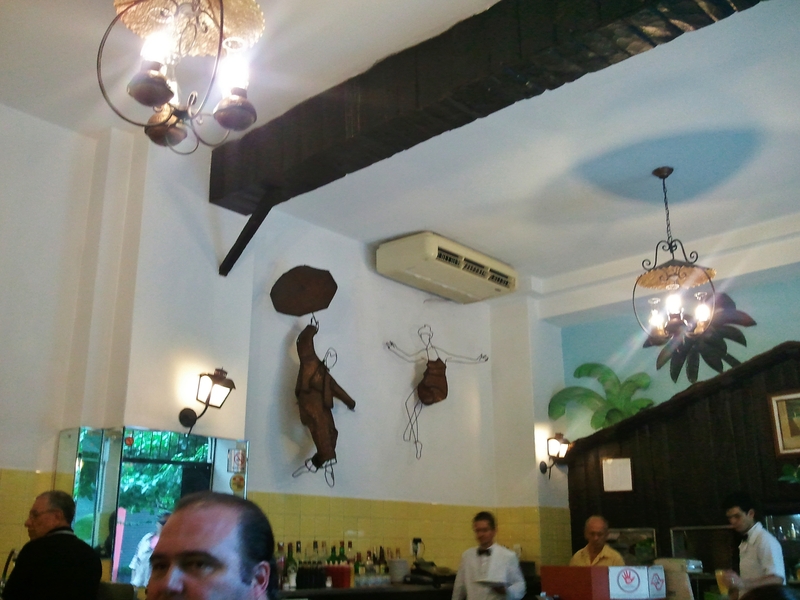 It’s an interesting mix – Oscar Freire is all designer boutiques and high-end restaurants, though the locals say that trade is a little precarious. Augusta on the other hand is known for drag queens and prostitutes. 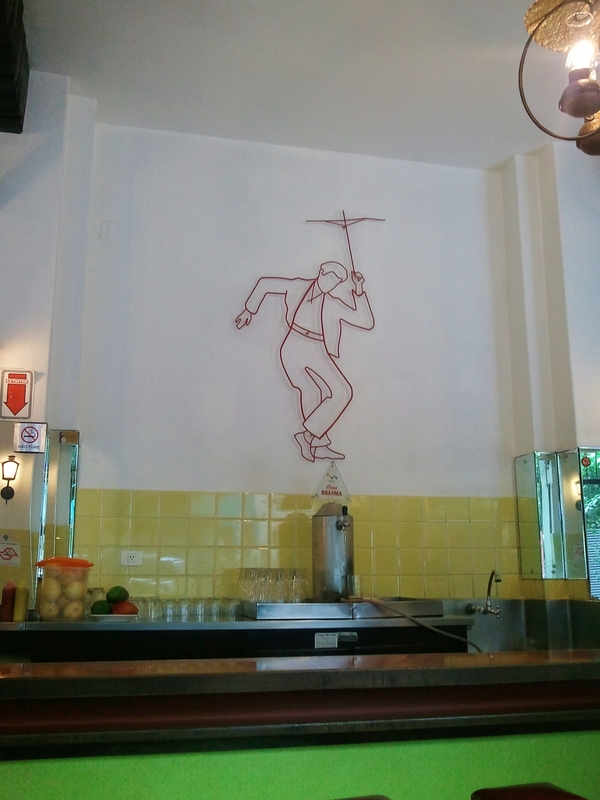 In previous generations it was known for chic coffee bars and the fashionable youth style of la dolce vita. 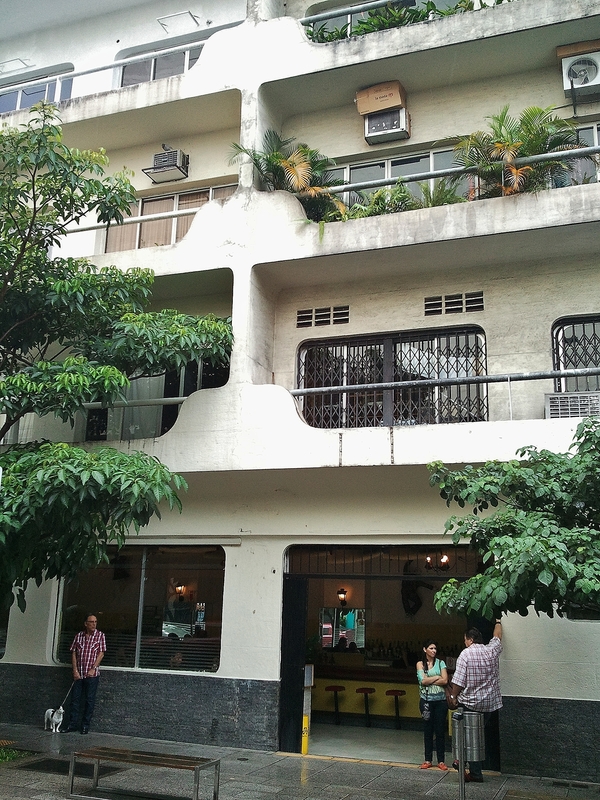 The building on the corner is an elegant example of Brutalism, the raw concrete cast in flat facades pierced by rounded windows. 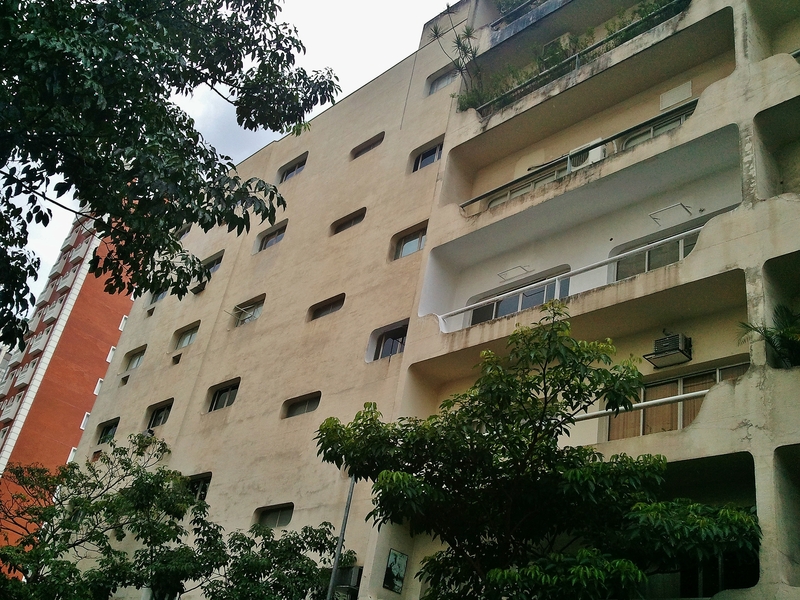 The concrete of the balconies is harder to keep clean, and the inhabitants have domesticated them with paint, but the faintly nautical effect can be glimpsed behind the abundant plant life and inserted air conditioners. 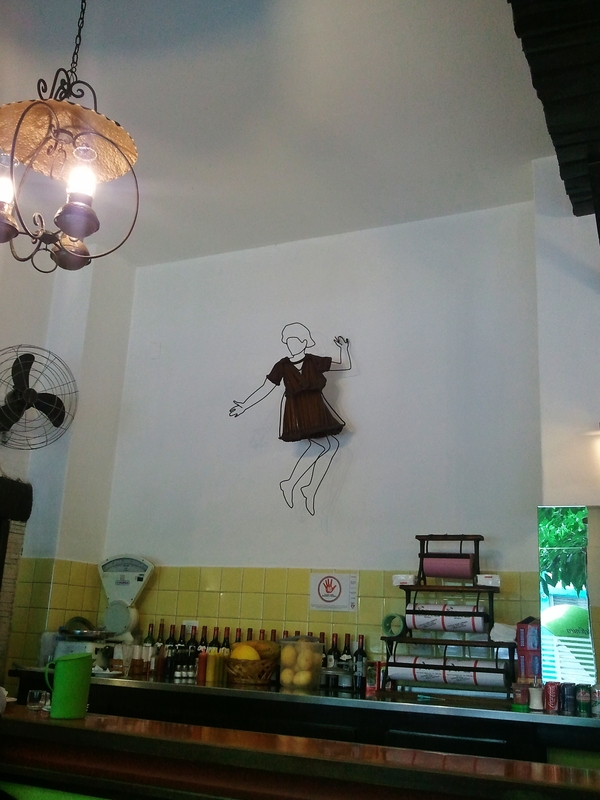 A graphic sign used to grace the shopfront on Oscar Freire, showing a man drawn in black and white dancing with a coloured umbrella. (Google Earth is keen on copyright.) Lanchonete (pronounced lanchonetchi) Frevo has been here since 1956. On Sunday afternoon it’s quiet, though it does a brisk trade during the week. The diner is famous for beiruites – a cross between a hamburger and a steak sandwich, it’s a slice of beef with sliced tomato, melted cheese and oregano, in toasted pita bread. A small one is a decent snack. A chope of draught beer makes a refreshing accompaniment. Service is copious, fast and friendly. The business is built on this simple fare. The decor, unchanged since it opened, has moved from being out of fashion to being a design classic, by virtue of standing still. Even the appliances – scales, beer pump, air conditioning – are vintage. They don’t make ’em like that any more. Primrose yellow tiling, fixed red bar stools, and wooden decoration of the supporting beams, window sills, hanging lamps and the front of the kitchen – styled as a beach hut, complete with plastic palm trees – anchor it firmly in the 1950s. The same colour scheme of grey, red and primrose yellow is used in its upmarket sister site. The square tables start to fill up, some pushed together for groups of family and friends. I order dessert, discovering that they do not serve coffee, so I order another chope. The bevelled mirrors bolted to the walls, even the taste of the dessert – strawberry ice-cream with tinned fruit salad – is 1950s. 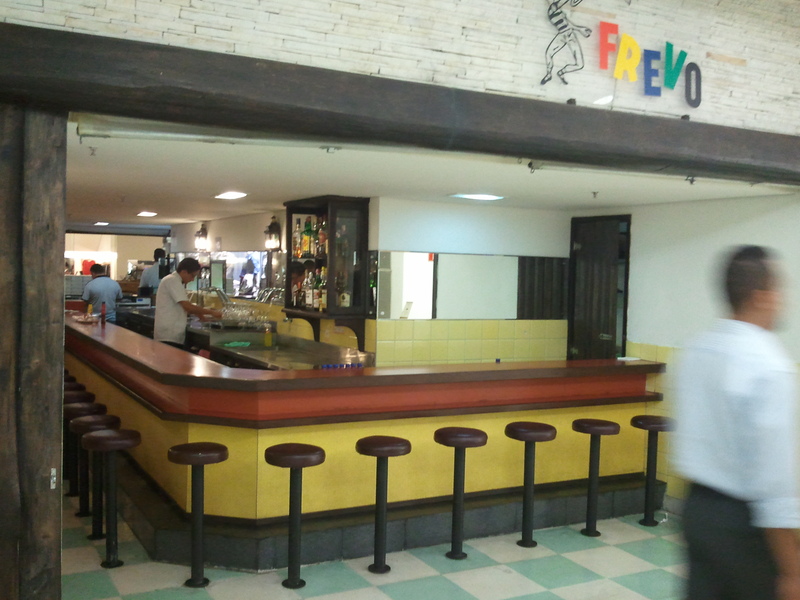 Frevo is an institution, one of those places which has been around long enough to boast about it, with black and white photographs, with regular and one might say ancient customers, and a venerable patron. And the name? Frevo is the music and dance of carnaval from Recife in the north-east of Brazil, the umbrellas integrated into an acrobatic dance routine. Perfect for a rainy Sao Paulo carnaval afternoon. My sweetheart has done so very much travelling, particularly throughout her early life. I confess I sometimes feel envious, yet… not quite envious enough to board a plane! But it does sound fascinating. She tells me of places she has been, even in the former Soviet Union long before such walls and curtains fell. She will describe some remote church in Estonia; or I will even remember a story she told me long ago, and after some clicking about, I can sometimes find a photo of the very spot she described so very long ago.